Click above to stream / play ! 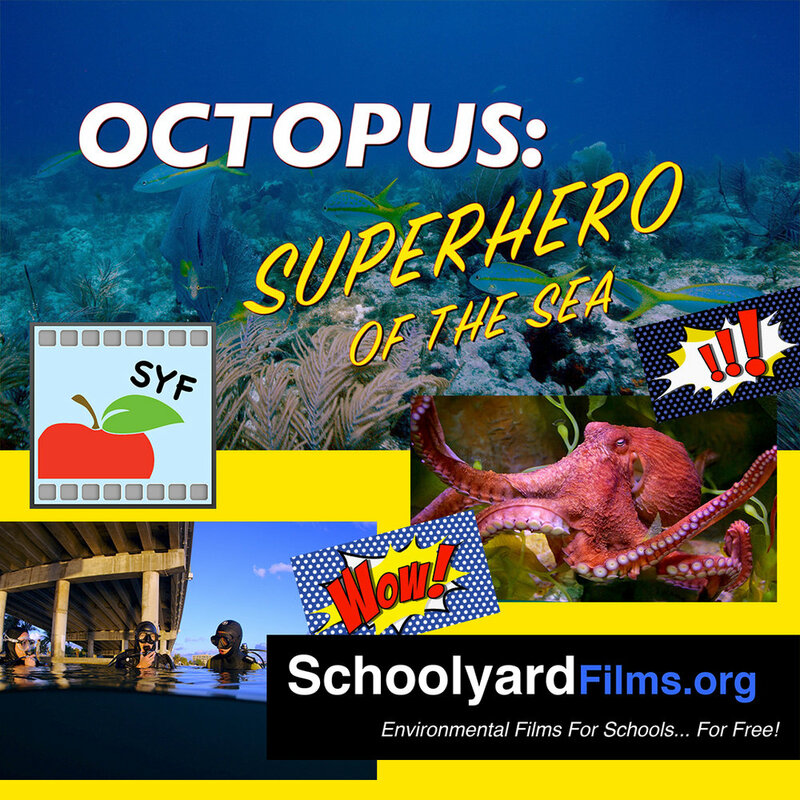 Join High School student-explorers, Liam and Olivia, as they learn from Marine Biologist, Chelsea Bennice, about the amazing superpowers of her research subjects, the Octopus! These smart superheroes of the sea have incredible abilities and adaptations. Using camouflage, mimicry and jet-power they outwit their predators and learn new tricks to solve problems. Students from four different schools in three different locations learn about local environmental issues and commit to making a difference in their community, and for their planet. Service Learning is much more than community service, it can influence the student's life in a substantial way, and maybe even change the world. High School students dive and collect data on an artificial reef to learn how to promote and protect corals, 4th graders help native Apple Snails and restore native trees in the wetlands of Florida’s amazing Everglades... and in New York, students are finding solutions to help repopulate ancient oyster beds and clean up the waterways around Manhattan. Amazing projects… for the Planet! Join our dive team and explore the massive hidden underground rivers, caverns, and waterways of the Floridan Aquifer. Quadrillions of gallons of crystal clear fresh water "spring" to the surface all over Florida and the southeast United States... but although it is clear water, is it clean water? Is it safe to drink? What are the impacts of generations of agriculture and urbanization? We follow technical diver, Jill Heirnerth, and a team of explorers and scientists to find out. We talk to farmers and researchers about a sustainable future. Students learn how essential the Aquifer is for millions of people and how we must all work together to keep it safe. A short "Behind the Scenes" for Schoolyard Films’, "Clear Water, Clean Water? - Exploring the Floridan Aquifer." Technical diving and underwater filming with Director Commentary from Tom Fitz about the Floridan Aquifer. A cave diving film about fresh water resources, geology, hydrodynamics, exploration and team work. … takes an upbeat look at a downbeat topic - coral reefs. Home to 25% of all marine species, coral reefs protect the coastlines of more than 100 countries and provide 500 million people with jobs. They are also taking a huge hit from climate change, ocean acidification, and other pressures, but there IS hope! Join us as we team up with Mote Tropical Research Lab and the Coral Restoration Foundation, both in the Florida Keys. Their ground breaking work with accelerating coral growth in the lab, creating nurseries in the ocean, and replanting back to the reefs is nothing less than fantastic. Their efforts creates hope for the future of sustainable coral reefs around the globe. Global Climate Change is effecting all of us, but the images of receding ice and its devastating effects on Polar Bears may seem far away. What can anyone do to help? High School student, Kylee Sipowski, has an idea! She shares her passion for collective action in the fight against Global Warming. We talk “Live” with researchers working in the high Arctic and learn from them what problems we face and what we can do to help. Kylee networks with students, her local community, and international organizations to put a conservation message into action. Working together, we can make a change for the better… and help the Polar Bears in the process! Join high school student, Phoebe Fitz, in her quest to learn about humpback whales. She teams up with scientists who study the whales in Hawaii, and learns first-hand what it takes to work on the high seas with these magnificent animals. In Lahaina, she visits a local high school and meets students who are actively involved in the humpback studies. ...is the remarkable exploration of a prehistoric animal and a modern medical marvel. Middle School students in South Carolina investigate the crabs, their life cycle, habitats and the threats that affect them. One of nature’s puzzle pieces, they fit into place as an important partner with humans. ...is the story of Indo-Pacific Lionfish invading the Atlantic and Caribbean with catastrophic results. This non-native species has no local predators and is propagating at a rate that adversely impacts the coral reef habitats of the Eastern United States, Caribbean, and South America. Scientists monitor the situation, laypeople learn to manage the invasion, if only temporarily, and high school marine biology students take a close look at the feeding behavior of this voracious predator. This is a story of communities banding together for environmental protection and of proactive advocacy for sustainable habitats. In Central Florida a spring-fed river spills millions of gallons of fresh water every day towards the sea. The Rainbow River is a haven for wildlife, and a turtle paradise. We follow two turtle scientists who study these ancient creatures and use their status as indicators of the river’s health. In a captivating account of rescue and rehabilitation, "A Dolphin's Return" introduces Cutter, a young Atlantic spotted dolphin found in a busy harbor in Key West, FL -alone, dehydrated, and malnourished. Join us as we follow Cutter's journey from the ocean to captivity and back to the ocean again. You will get a glimpse into the world of wildlife conservation and the role of science, partnerships, and technology in the everyday work of scientists and conservationists. The Busch Wildlife Sanctuary in Jupiter, Florida gets all the action: hospital calls when a bobcat is hit by a truck and needs stitches, and then panicky airport employees dialing to say someone’s trying to ship threatened Florida panthers. It's all in a day's work for David Hitzig, animal caregiver with a heart of gold and a sanctuary to run. The 1981 ﬁlm "On Golden Pond" shows us a place of sublime beauty and tranquility. But where is this - or is it simply another creation of Hollywood magic? Our ﬁlm looks at the real Golden Pond and its wildlife–loons, deer, beavers, porcupines, and more–and our story is told through the eyes of an avid hiker and biologist who has been summering here on Squam Lake for the past 35 years. ...tells the story of competing water interests between agriculture and wildlife, and how one group finds a sustainable solution for all. Set on the Ox Yoke Ranch in Paradise Valley, Montana, this film highlights a successful collaboration between the Murphy Family, Trout Unlimited, the Gallatin Valley Land Trust, and the State of Montana, to restore the connection of Fridley Creek. As students learn about the restoration of this small creek, they will develop a broader understanding of connections between land, water, fish, and humans. As Montana biologist Pat Byorth eloquently states, "Our fate is tied to the fate of the rivers." There are more types of bats living on one tiny island in Panama than can be found in all the USA. How can this be? An international team of women scientists brave the tick-infested night forest to find out just how 72 bat species coexist in such a small place. There’s more to Florida than just theme parks and Miami Beach. "Florida’s Wild Side" takes a look at this southern state’s iconic wildlife, told through the eyes of local residents–artists, scientists, and laypeople–all of whom share one thing in common: a passion for Florida’s wildlife.